After a seven-year search, the lawn and garden distributor has found a new site and will be expanding operations to a new location within Bicester. E.P. Barrus Ltd is the distributor of leading lawn and garden brands in the UK including Cub Cadet, Lawnflite, WOLF-Garten, Wilkinson Sword and Energizer. Relocating to the new 16-acre site will enable the company to consolidate its operations under one roof, and remain in Bicester, Oxfordshire. The site forms part of the commercial space located on the edge of the unique Graven Hill Development to the south of Bicester, formerly owned by the MoD. In addition to the familiar household garden brands, Barrus markets and distributes its products across a wide range of other sectors including marine and industrial. Engineering excellence has always been a strong focus for the company, with expertise in specialist applications engineering support, and the most modern custom-engine building facilities. 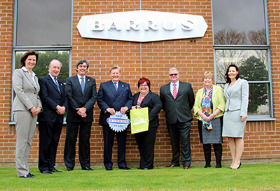 Barrus originally moved from London to Bicester in 1977, choosing the site for its excellent central location. This latest move is just as significant, as the company looks forward to the next phase in its 100-year history. Remaining in Bicester is also important to the company. As a major employer in the town, Barrus has maintained a commitment to recruiting local people and has developed long-term relationships with Oxfordshire schools, colleges and universities offering work experience placements and apprenticeships to young engineering students. Many of these students have taken up a career in engineering and have become long-standing Barrus employees. It is anticipated that Barrus will occupy the new site in 2019 when the Phase 2 land transfer from MoD to Graven Hill is due to complete. Barrus is working with Graven Hill Village Development Company to see if it is possible to secure earlier occupancy.